Learn to handle downlink messages from Sigfox Backend with Ubidots. Sigfox wide-area, low power devices with Ubidots IoT Application Development platform makes for a simple to integrate IoT solution all the way from hardware to the end-user's experience. By following the steps provided is this tutorial, you will be able to handle and send downlink messages to your Sigfox Device from Ubidots. This integration will require the UbiFunctions add-on, a featured tool of Ubidots IoT Application Development platform that allows users to create a private, custom API endpoint or endpoints for their applications. If you are not familiar with Sigfox or the Sigfox Backend, we recommend you check out this Sigfox Technology Overview before proceeding much further with your POC or hardware setup. Downlink messages let your IoT Sigfox devices perform control actions based on a received message. 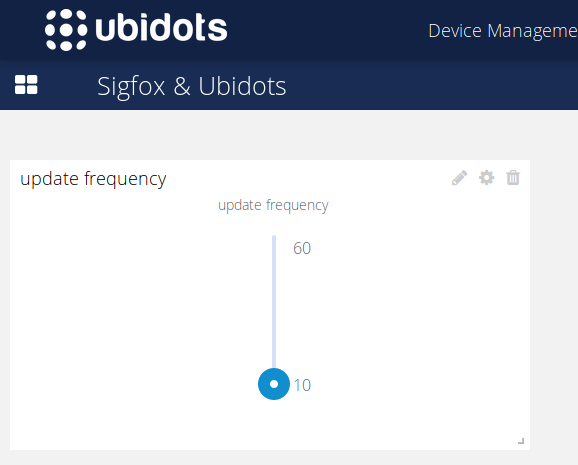 For a better understanding, let's suppose that you want to be able to modify the "update frequency" of a device by adjusting a variable in your Ubidots dashboard. 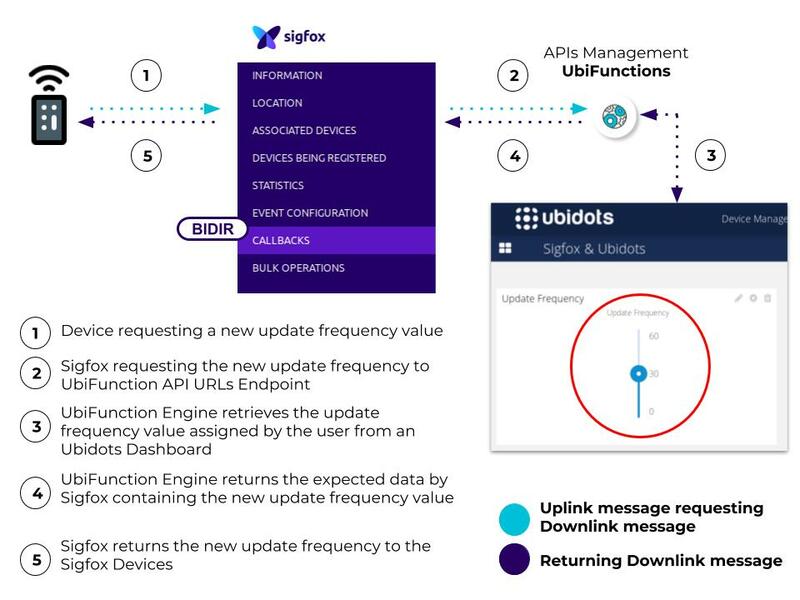 To execute a downlink message and sent input data from Ubidots to your Sigfox device you'll need a Ubidots platform to assign the value which is going to establish the new update frequency value for the hardware. 1. Go to your Ubidots account. If you already don't have one, create it by clicking here. 2. 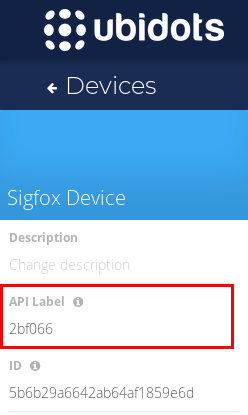 Now, assuming that you already have a Sigfox Device transmitting data to Ubidots account by using the Sigfox device ID as Device Label, it's time to create a variable to set the desired update frequency inside the device. 3. Next, go to the Dashboard section of your Ubidots account by clicking "Data". 4. Then, add a new control widget to the dashboard. To add the new widget press the "+" icon located at the right upper side of the page, then select "Control –> Slider –> Add Variable –> Sigfox Device (Sigfox Device ID) –> "Update Frequency" Variable (previously created). 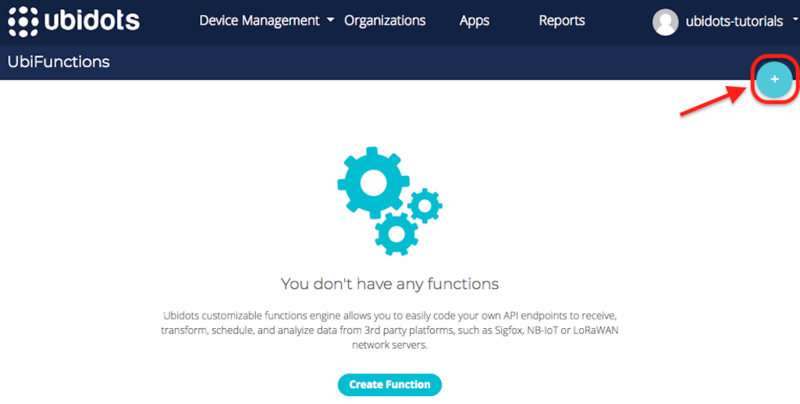 Create an UbiFunction by going to your Ubidots account –> Devices –> Functions. 3. By default, every UbiFunction is populated with a sample code without any configuration. You will need to configure the function in order to make it work best for your needs. The sample function will not work with Sigfox. To begin, assign the name desired for your UbiFunction. We recommend using the format "Brand-Reference", i.e. "Sigfox-Suntech", "Sigfox-Oyster" or "Sigfox-Thinxtra". Also, it is advisable to relate the name to the kind of message is being sent; for example, "downlink" can be placed at the end of our function's Name: "Sigfox-Suntech-downlink." For this tutorial, the function will be titled "Sigfox-Device-Downlink." 5. 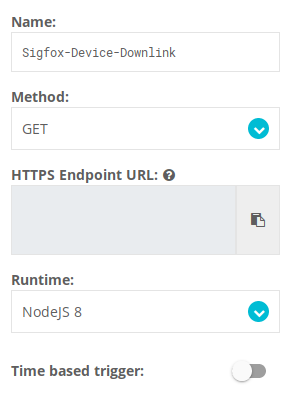 Now it is time to deploy the UbiFunction in order to generate the API endpoint URL which is going to be used to transmit the data from the Sigfox Backend to Ubidots. 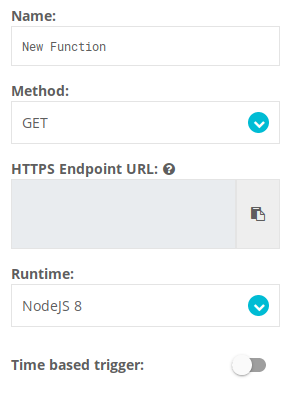 IMPORTANT NOTE: This resulting URL Endpoint is important because it is the endpoint that you will direct your Sigfox callback to send the uplink message that requests the downlink message. If this is confusing, please watch this explainer video. 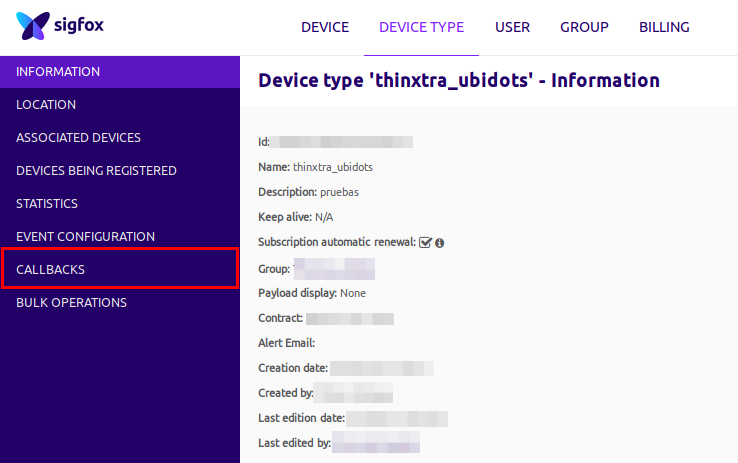 Where, ubidots-tutorial is your Ubidots username and sigfox-device-downlink is the Name assigned to the function within the UbiFuctions engine. * data from Ubidots to build and send the data expected by Sigfox. // Main function - runs every time the parser is executed. // "args" is a dictionary containing ubidots token, Sigfox device ID, and variable label. At this point, the sample code provided is designed to retrieve the last value assigned as update frequency value. 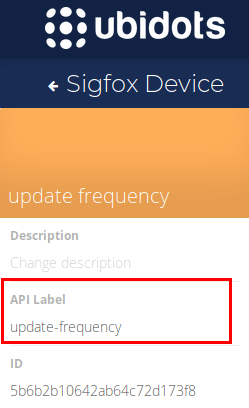 Then, the function will return the expected data by Sigfox which contains the new update frequency value plus the Sigfox device ID to know which device is going to being updating its update frequency. 7. Now it's time to save the changes made, and deploy the downlink function in the UbiFunctions engine. To do so, just press the "Make it live." With the changes already saved, let's setup the Sigfox Callback to start receiving the downlink data from Ubidots into the Sigfox Device. Sigfox Callbacks use HTTP requests to transmit data bi-directionally with Ubidots. In this case, we are going to show you how to configure the Sigfox Callback to transmit data from Ubidots to Sigfox Devices using the UbiFunctions engine previously discussed. 1. To begin, access to the Sigfox Backend where your hardware is transmitting data. To save the changes press "Ok". At this point, a new callback is needed. To create a new callback, select "New". Then, select "Custom callback". In the below window, you will note that you must fill the configurations of the callback which should be communicating data with Ubidots bidirectionally. Once you've verified the callback, press "OK" tp save the changes. 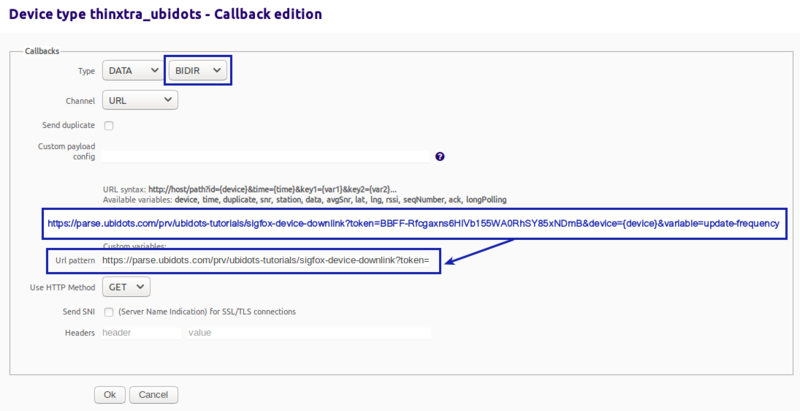 Now your callback is ready and enabled to handle data from Ubidots to Sigfox Devices. At this point, the data is going to be requested by the Sigfox Device via an uplink message pointing to the UbiFunction engine (previous step). The function will be executed upon receipt of data and will return the expected response from the control variable to be used as the downlink message. With the UbiFunction and Sigfox Callback configured, you'll be able of trigger downlink messages from Ubidots to your Sigfox Device once the Sigfox Device request it (using an uplink message). As we mentioned above, the device will send a uplink message requesting the downlink message to Ubidots. How can I request a downlink message from my device? - This depends on the manufacture and documentation for each Sigfox Device. It's important to mention that requesting downlink messages will be different for most, if not all different hardware manufacturers. Accordingly, Ubidots recommendations to refer directly to the Technical Documentation of the manufacturer to better understand the configuration required to fit the required "Downlink Messages" structure. Now, for testing purpose we decided to used a Thinxtra Xkit previously configured to request a downlink once the embed button of the board is pressed. Now the value received can be assigned as a new update frequency value in the device configurations. To make things easier for you, plus the logic and follow up of this guide, we created a new raw variable in Ubidots to set the value desired to be triggered as Downlink message, but this it's not necessary thanks to the code provided above. 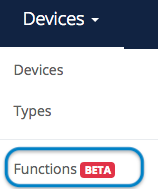 Remember that any time a new device label is recognized by Ubidots, a new device is automatically created. This is true for using this UbiFunction sample coded provided. And, with this function, multiple different pieces of hardware can point to the same UbiFunction and based on the Sigfox Device Label, Ubidots will create a digital device in the platfrom, or update the digital device that already matches the Device Label of the incoming or outgoing data. With this simplicity to onboard 100s and 1,000s of devices, it is now time to create the dashboards and events of your IoT App and start controlling & monitoring you devices using Ubidots IoT Application Development Platform. So in the step #3, if the variable assigned in the downlink message request does not already exist, because the downlink first comes to Ubidots as an uplink request, any variables labels attached to that uplink will be automatically created. This includes the downlink variable if properly coded using the sample code or your own code. IMPORTANT: Even though the sample code will automatically create the control variable, in order to fully control and send a downlink, you still must create the control widget that will update the control variable. 1. To verify if the message was properly triggered by the UbiFunction engine, simply press the "envelop" icon located in the control bar of the function you're looking to track. This will display the logs and executions of your function. 2. To verify the if the downlink message was requested and sent properly in the Sigfox backend, go to the "Messages" from the Device ID tab. In this section, you will be able to see all the messages (uplink & downlink) handled by a device selected. With this, your Sigfox Callback ready and the UbiFunction engine are properly configured and transmitting data from Ubidots to your Sigfox Devices. Now it is time to develop your application with Ubidots IoT Application Development and Deployment Tools. Ubidots is an Internet of Things (IoT) Application Development Platform that empowers system integrators and innovators to launch control, monitoring, and automation applications that turn sensor data into actionable insights. Hiring an engineering team to merge the physical world with a digital world and create an IoT application that both functions and looks great is costly in both time and money, so Ubidots did it for you. Ubidots exists as an efficient and economical resource to develop private cloud-based IoT applications and integrate data-driven solutions into enterprises and research to improve our working economy.